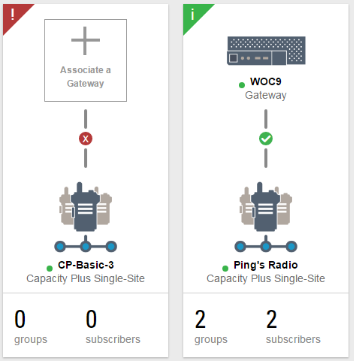 Gateway health reports relate directly to the function of the WAVE Gateway and its connection to the WAVE services required for radio integration. If you have a connected WAVE Gateway device, you can view it in the Radio System page. 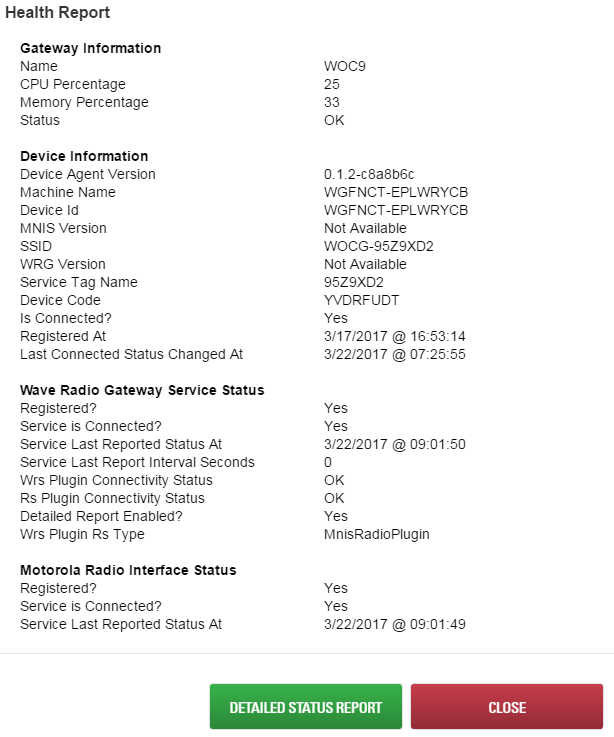 The following image shows two Radio Systems from the Radio Systems page. The Health Indicator appears in the upper left corner of each Radio System. A red exclamation mark indicates a problem. In the image above there problem is the lack of a Gateway device. Without an assigned Gateway, the radio system has no connection with WAVE. A green ‘i’ symbol indicates a healthy Radio System with no known issues. It is connected and successfully routing data between the radio system and the Broadband clients. Clicking a health indicator opens the health report page. The following image is an example of a health report taken from the healthy radio system in the screenshot above. Clicking the DETAILED STATUS REPORT button will download a more detailed report in PDF format. Clicking the CLOSE button will terminate the health report page and take you back to the Radio System page.